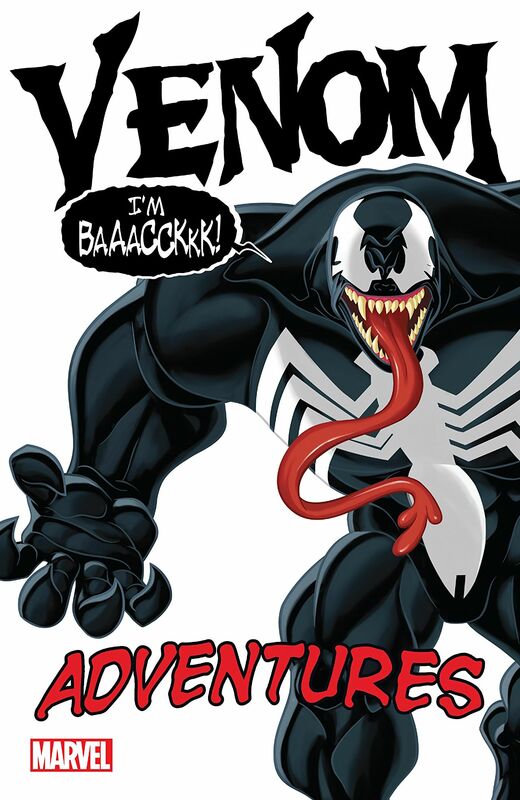 Venom Adventures Review – AiPT! Mostly peppy re-tellings and re-treads in this differently-focused Venom collection. Writers Fred Van Lente and Joe Caramagna, alongside artists Michael O’Hare and Cory Hamscher, must’ve known they were up for a challenge when tasked with adapting Spider-Man’s most lethal, dark, and venomous foe into stories for a younger age bracket when they sat down to draft or adapt the ones collected in Venom Adventures. It’s no surprise, then, that they struggled a bit with the execution. Still, there’s some charm, some wit, and some endearing energy here that keeps things from being a total disaster like one might expect. Van Lente, in particular, shows a real knack for keeping things light and energetic in a way that still conveys the core elements of the Venom character throughout the first three issues of this collection. The jealousy, rage, and ferocity that define the character are honed for a younger audience but still palpable while played funnily off things like a penchant for calling Spidey “S.M.” (Which Spider-Man, expectedly, hates) as Spidey’s new Symbiote suit, eventually attached to cat burglar Eddie Brock, attempts to re-win his affection. It’s unfortunate that Van Lente has a grating knack for having character say things while the visuals are explaining the same thing such as a shot of Spider-Man’s webbing going out – a “FZZZZZZ” sound effect emblazoned on the page – while Spidey is also saying “wha – my web shooters…jammed!” that feels like doubting the audience for these stories, but for the most part, things remain effervescent, funny, and peppered with enough references to stories new and old that they hit their tonal target well enough. I was particularly endeared to Venom’s constant references to his “Lethal Protector” status and mantra which he continually tries to prove to Spidey as…not as evil as it sounds. Hamscher and O’Hare’s art keeps up for the most part. Things are clean — lighter than the usual Venom fare of course, but also somewhat imposing and gnarly when needed. It’s near impossible to get past our Lethal Protector’s weirdly defined, horse-like teeth — but aside from that and some occasionally overly-stuffed layouts that focus too much on character movement and too little on background detail, the artistic talent here is commendable if not entirely competent. Things hit a bit of a hurdle, though, when the collection reaches Caramagna’s adaptations of the Marvel Universe Ultimate Spider-Man episodes focused on Harry Osborn’s time in the Venom suit. It’s readily apparent that these stories play better on the screen, and that a lot of the character, pacing and affect is lost here despite the writing’s best efforts and without compelling art to carry them, even the best twists and ideas, of which there are a few themselves, stay inert. All said and done, no, this isn’t a book that will be any Venomaniac’s crowing collection piece — it’s also not trying to be. Judged wholly on its laurels as a lighter, different and focus-shifted take on the character, played against an often funny, quippy, and endearing cast of characters, it’s a fun read that passes by quick enough to get to the more serious stuff for more serious readers, and lets younger audiences experience some of the Venom fun, too. There’s no harm in that. Not fit to satisfy the appetites of the more serious Venom fans, but perfectly suited to introduce the character to younger audiences, and have some fun along the way. This collection has some real shining moments and also some real dull ones. Van Lente's Spidey is a lot of fun! Tons of great quips and references here that had me genuinely laughing out loud. Venom's core tenets remain intact while the character is smartly shifted to being appropriate for a younger audience. I'll never forget the first three issue's take on Venom's teeth which are actually teeth that belong to a horse and not Spidey's greatest villain. The television adaption issues collected, while admirable attempts, fall completely flat.